These additions mark a significant expansion of the Wellements line, which is comprised of USDA certified organic, preservative-free, gluten-free, non-GMO, products made from simple ingredients that are bottled in glass. 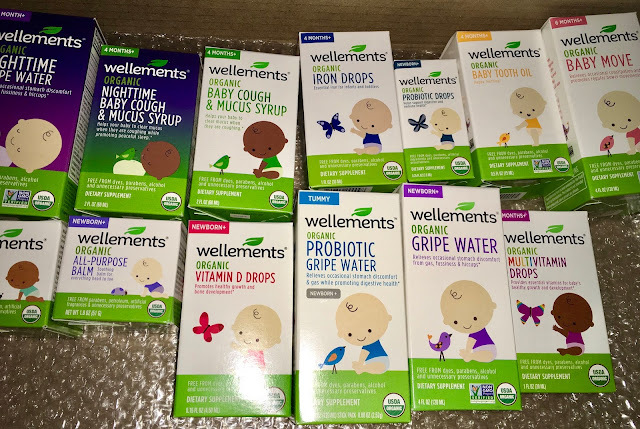 The new products round out Wellements’ existing line of supplements and remedies that address ailments like teething and colic, that infants and toddlers experience on a daily basis. ● Wellements Organic All-Purpose Balm soothes every part of baby’s precious body from head to tiny little toes. Ages newborn +. MSRP $9.99. ● Organic Soothing Throat Pops for Kids helps soothe and calm little throats. Ages 3 years +. MSRP $6.99. ● Organic Children’s Cough + Mucus soothes dry throat and helps clear mucus while coughing. * Ages 1 year+. Also available in Children’s Nighttime (1 years+), Baby (4 months+), and Baby Nighttime (4 months+) formulas. MSRP $9.99. ● Organic Probiotic Drops help support digestive and immune health* Ages newborn +. MSRP $27.99. Wellements is also announcing their expansion of retail distribution this spring, at Expo West. With current distribution in Walgreens, Wellements will expand their offering from 6 products to 11 products in March. In April, Wellements will roll-out product in CVS and Walmart, for the first time, followed by an Albertsons/Safeway launch in May. Wellements products are developed by parents for the children they love. Founded in 1984 and based in Scottsdale, Ariz., they only create product that is USDA certified organic, preservative-free and bottled in glass. As part of a larger movement, Wellements is dedicated to improving the well-being of families by providing education, products, and support for parents while making a lasting, positive impact on our communities and our planet. Wellements.com, or @Wellements on Facebook, Instagram or Twitter.